Walking through the Capitol campus, I frequently come across ornamentation in our buildings made from various metals. I was recently taking in the splendor of the gilded Torch of Knowledge above the Thomas Jefferson Building when my mind began wandering through the many additional decorative elements found within that grand building. Architecture is always representative of culture when it is built. The 19th century's influence on the design of the Jefferson Building can be seen from the theatrical and heavily ornamented Beaux Arts style, which uses lavish materials like gold. Notable gold features include the striking ceiling of the vestibule near the Great Hall and the coffered dome of the Main Reading Room with 320 gilt rosettes. Even the copper roof was initially gilded with 23-carat gold; imagine that! 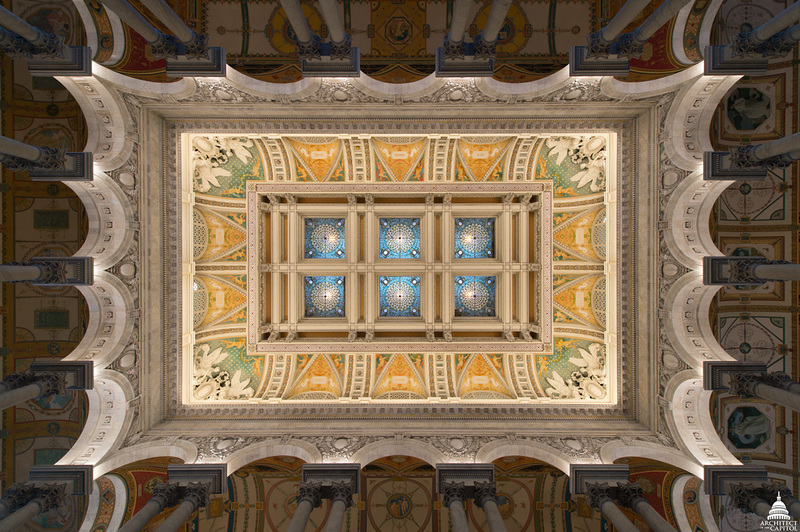 Looking up at the laylights of the Library of Congress Thomas Jefferson Building Great Hall. Some of the precious details inside, however, aren’t treated with this same embellishment but with another more surprising metal instead. Aluminum was chosen for leafing in several prominent places of the building that are not obvious at first, including around the ceiling laylights of the Great Hall. Aluminum wasn't always as ubiquitous as it currently is. Just before the Jefferson Building's construction, the largest piece of cast aluminum that had ever been created was the 8.9-inch tip placed atop the Washington Monument in 1884. It was considered our most precious metal at the time – more so than gold and silver – because it was incredibly difficult to obtain and to refine. 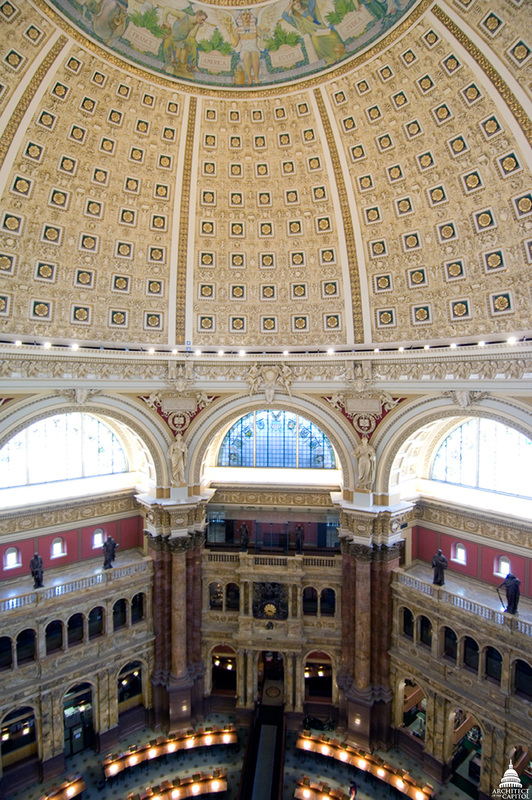 Gilt rosettes in the Main Reading Room of the Library of Congress Thomas Jefferson Building. The gold, copper, bronze, aluminum and other metal elements all play an important role in the inspiration of the Jefferson Building. They are a delight to the senses. Treasured spaces like these on the Capitol campus create inspiring memories for staff and visitors alike. And the memories made here are precious indeed.